Access our constitution so you know how we operate, what our officer job descriptions are and if you are interested in running for a position or nominating someone, please let Nancy Kress (nkress@briarcliffschools.org) know! Great article that validates studying a second language! Public School teachers in New York State that have achieved tenure are eligible for the Albert Shanker scholarship to cover almost all of the costs of National Board Certification. Apply for National Board Certification on-line at www.nbpts.org before applying for the Shanker Grant. Record the candidate identification number and make an extra confidental copy of your $500 payment.The candidate identification number will be needed for the Shanker Grant application. "The Box" containing your NBC materials will arrive about three weeks after applying to NBPTS. Do NOTthrow out the box. Your portfolio entries will be submitted in the box. Remember to submit a copy of your proof of payment /NBPTS application with your Shanker Grant. After you complete the process the $500 payment will be refunded through SED (usually the March after submission). See below for additional funding available for retake candidates and renewal candidates. NYSUT has lobbied on behalf of teachers for continued support of the Albert Shanker Grant. We are grateful that Albert Shanker Grant provides equal access and opportunity to pursue National Board Certification to all eligle teachers in NYS. NYSUT has an Informational Bulletin about NBC. For more information on National Board Certification in New York State, please visit www.nbcny.org. Here's something that I found on Twitter. Here's a link to newspapers throughout the Latin America and Spain. You can use these for reading comprehension activities, or to simply have students find and underline/hightlight specific verb tenses/cognates/vocabulary/etc. I find this useful to encourage growth in the target language at any level. Has videos and posters too. 7 Tips for the first week of Spanish class: Have a great start of the year! 7 tips to keep to start your school year off right! 1. Teach in the target language. Set the tone on the first day by speaking only in Spanish. Even in Spanish I! My lesson for the first day of Spanish I is ¿Cómo te llamas?/Me llamo... and I give students Spanish names or let them choose their names. 2. Make name tags. Yes, even in high school.It's the fastest way for me and my students to learn each others' names. Take a piece of paper and fold it into thirds. Students write their Spanish names on one of the sides. Set the name tags on the desk in a triangle with the name facing out. Have the students bring the name tags to class for the first week or two, until everyone knows each others' Spanish names. 4.Give students a "Coping Card." To play: in partners, Help your students communicate in Spanish by giving them a paper to use in class with the most common classroom phrases. I allow them to use it at all times (except testing.) Eventually, they won't need to look at the paper at all. 5. 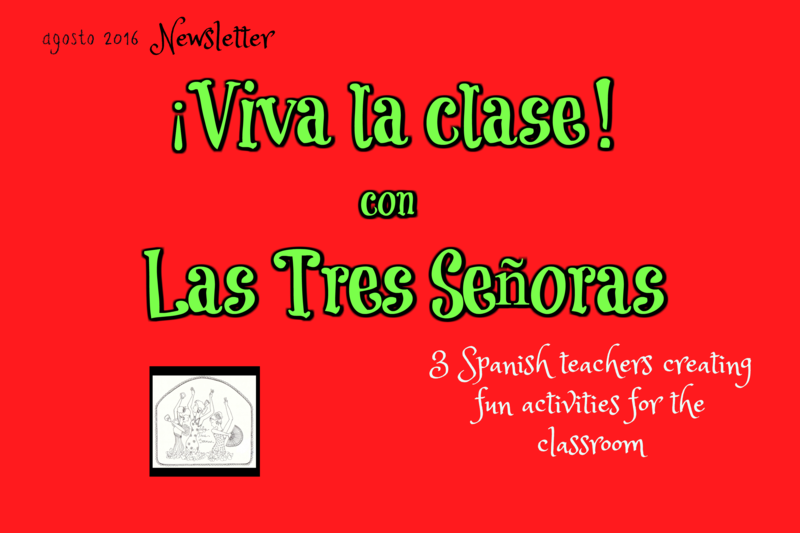 Explain why the class is taught mainly in Spanish. On the first day of school, as the students walk through the door, I give them a paper written in English that welcomes them to class and explains why I am going to speak mostly in Spanish during the class. It helps them to know what to expect and not freak out once class starts in Spanish. 6. Use a variety of activities. Songs, commercials, communicative activities, games, Mix it up and give the students a variety to keep their interest and get them excited about coming to class. 7. End the week on a high note with a fun game! I make sure that I save 10 minutes at the end of the class on Friday for a game. I teach them the counting game of ¡Caramba! For Spanish classes that don't know the numbers yet, I play Cognate Challenge: a game where students must guess the English word (teléfono, telephone.) They hear the word in Spanish and must guess the English word. If the student is incorrect, they are out. They may join in again if they guess another word correctly that another students has answered incorrectly. I also play Ensalada rusa, a team word game. Learning to speak was the most remarkable thing you ever did. It wasn’t just the 50,000 words you had to master to become fluent or the fact that for the first six years of your life you learned about three new words per day. It was the tenses and the syntax and the entire scaffolding of grammar, not to mention the metaphors and allusions and the almost-but-not-quite synonyms. But you accomplished it, and good for you. Now imagine doing it two or three times over — becoming bilingual, trilingual or more. The mind of the polyglot is a very particular thing, and scientists are only beginning to look closely at how acquiring a second language influences learning, behavior and the very structure of the brain itself. At a bilingualism conference last weekend convened by the Lycée Français de New York, where all students learn in both English and French, and the Cultural Services of the French Embassy, language experts gathered to explore where the science stands so far and where it’s heading next (disclosure: my children are LFNY students). Humans are crude linguists from the moment of birth — and perhaps even in the womb — to the extent at least that we can hear spoken sounds and begin to recognize different combinations language sounds. At first, we don’t much care which of these phonemes from which languages we absorb, which makes sense since the brain has to be ready to learn any of the world’s thousands of languages depending on where we’re born. Doubling down on a pair of languages rather than just one does take extra work, but it’s work young children are generally not aware they’re doing. Bilingual people of all ages are continually addressing what research psychologist Ellen Bialystok of Toronto’s York University calls the dog-chien dilemma, encountering an object, action or concept and instantaneously toggling between two different words to describe it. Such nimble decisionmaking ought to improve on-the-fly problem solving, and studies show that it does. Excelling on the Stroop test is hardly a marketable skill, but what it suggests about the brain is something else. Sean Lynch, headmaster of the LFNY, previously worked in a multilingual school in France in which all of the students spoke French and at least one of 12 other languages, including Japanese, Russian, Italian and Spanish. As is often the case with well-endowedschools, the students, on average, outperformed their age peers academically, and it’s impossible to determine how much of that is due to native skill and how much to the fact that they simply have access to better teachers, books and other resources. Still, Lynch observed that these students seemed to show a greater facility with skills that relied on interpreting symbolic representations, such as math or music. Lynch also believes — albeit based primarily on his own observations — that multilingual kids may exhibit social empathy sooner than children who grow up speaking only one language, which makes developmental sense. The theory of mind — understanding that what’s in your head is not the same as what’s in other people’s heads — does not emerge in children until they’re about 3 years old. Prior to that, they assume that if, say, they know a secret you probably do too. There’s a kind of primal narcissism in this — a belief that their worldview is the universal one. Once they learn that’s not the case, self-centeredness falls away — at least a little — and the long process of true socialization begins. There’s nothing that accelerates the acquisition of that kind of other-awareness like the realization that even the very words you use to label the things in your world — dog, tree, banana — are not the same ones everyone uses. Not every study out there finds benefits to bilingualism. Earlier this year, psychologists at Concordia University in Montreal studied 168 children ages 1 and 2 years old being raised by bilingual parents. In general, they found that the kids in the younger half of that cohort had smaller comprehension vocabularies — the number of words they appeared to understand — than kids being raised monolingual. The older half of the sample group had smaller production vocabularies — or words they could pronounce. This results, the researches believe, from parents mixing their languages when speaking to their kids, choosing the words they feel the children will have an easier time understanding or reproducing. That in turn leads to what linguists call code-switching — a commingling of tongues by the children that produces what Americans call Spanglish or Franglish when Spanish or French melded with English (this particular study produced more complex comminglings, since it included kids speaking German, Japanese and Farsi as well). However, Bialystok agrees that this is a short-term disadvantage of bilingualism, and says in most cases the kids catch up.